WHAT IS THE MINERAL BIXBYITE? 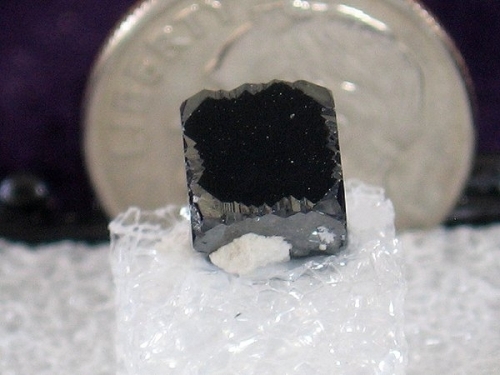 A RARE MANGANESE IRON OXIDE IN ISOMETRIC CRYSTALS THAT ARE METALLIC BLACK. EXTREMELY NICE SPECIMEN FOR YOUR COLLECTION. JUST CLICK ON THE PICTURE FOR A CLOSE-UP VIEW. BIXBYITE IS A RARE MINERAL FOUND MAINLY IN THE THOMAS RANGE, JUAB COUNTY, UTAH. IT IS A MANGANESE IRON OXIDE, DARK BLACK WITH A METALLIC LUSTER. THESE BIXBYITE CRYSTALS FORM IN ISOMETRIC CUBES WITH THE CORNERS MODIFIED BY OCTAHEDRAL FACES WHICH TRUNCATE THE CORNERS INTO A SINGLE FLAT FACE. THESE ARE 1/4 INCH SQUARE IN SIZE. A BEAUTIFUL SPECIMEN THAT WILL ENHANCE YOUR COLLECTION, AND THE PRICE IS RIGHT!